Early upload today! Three different uploads in one actually; the Lululemon X SoulCycle capsule, the Lululemon Lunar New Year upload (covered that in my post last week so won’t add it here, but it’s available to the public now) and a mini regular upload. I’m excited about the Lululemon X SoulCycle Capsule. I just really love the overall aesthetic of the capsule and how it combines edgy with fun. I’ve noticed Lululemon is doing a lot more branded fitness collaborations which is such a smart move. Branded fitness apparel is really huge in the retail community and anything that is SoulCycle, Peloton, Functional 45 etc etc. sells extremely well. Partnerships with these brands really put Lululemon in context with an affluent fitness oriented shopper who’s attention many high end fitness brands are competing for. I ordered this pair in the obsidian black because I have an undying love for splatter prints, and they are made of my favorite Lululemon material Everlux. They are way overpriced but because of the print + the neutral grey/black and because of the material I held my nose at the price. Oooh I really love this one too. This is so motocross inspired with the articulated sleeve and the high collar. I have an Adidas sweatshirt that I’m obsessed with that is part of a motocross capsule and it has the exact same articulated arm and high crew neck collar. I may need to splurge on this. "Gucci Marmont Small Matelassé Shoulder Bag"
"Lululemon X SoulCycle Haul and Review"
I cannot bear the price of to the beat tight reflective 24’’ in everlux, $148 is way too much! Nothing cute. Nothing if interest. I’m sad. I’m confused with the Lunar capsule…how is the black energy bra “lunar”? It looks just like a regular energy bra. Exactly! The same with the black Swiftlies, am I missing something? Black is never a colour used to celebrate the Lunar year, it’s usually gold and red for good luck and good vibes. I don’t share your enthusiasm for the SoulCycle Collection. I am happy for you, not your wallet, that they offer the tights in a splatter pattern, knowing how much you love splatter! Sometimes when you love something enough the price tag doesn’t matter, been there done that. The So Sherpa Jacket is a miss for me. It is extremely short but it’s those pockets in the shiny fabric that ruins it more for me, especially on the gorgeous green one. They did the same thing on the fleece jacket out a few months ago where they put this shiny/glossy fabric on the shoulders and part way down the arms. It was no surprise that jacket ended up in WMTM and was there for months. It looks like my no buy January is not in jeopardy. I really like the Love Tee Crew in Graphite Purple but there is no rush to buy now. I agree. I saw those pockets on the So Sherpa Jacket and couldn’t believe my eyes. I don’t know if those pockets could look good on anyone. Lmao!!! I think the jacket looks inside out, but I like your description better! It made me laugh. Totally agree with you about the SoulCycle Capsule. What a total bust and too much $$ on top of it all. I know SoulCycle is big but just not sure there are enough people that would buy into this capsule. 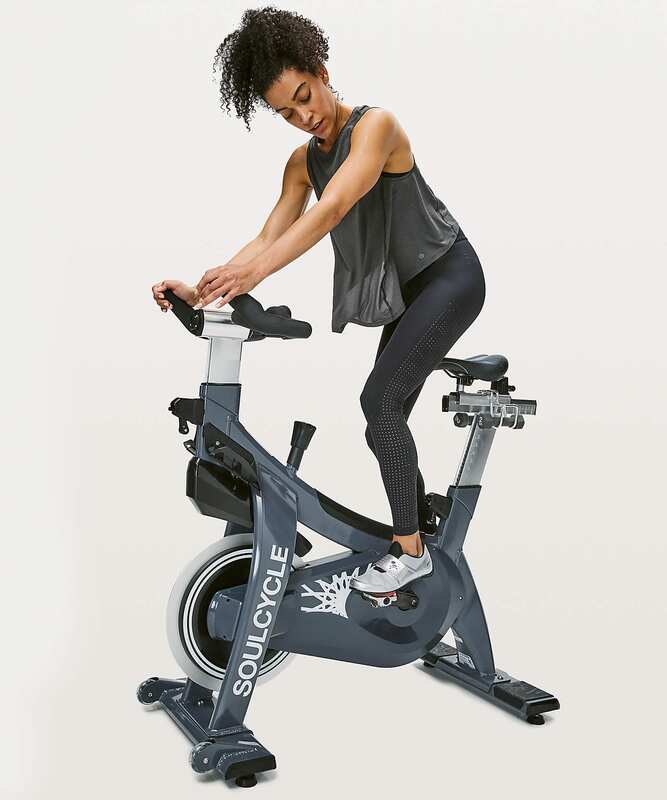 I know those will sit at my store or go quickly to the MD rack since there isn’t a SoulCycle within an hours drive or longer. The Sherpa Jacket is awful! Cannot remember the last time I actually liked something enough to buy. I am also unenthused. The only thing I find cute is the striped Love Tee but I won’t be rushing out to buy it. I also feel the prices are ridiculous. Thank you for being so on top of things! I bought the Lunar NY bag and bottle to try. I am also intrigued by the muscle and high/low tanks. This was a disappointing upload for me. I don’t understand the whole Soulcycle thing. There are no Soulcycle studios near me and I don’t do spin classes so I’m not sure why I would want workout gear that’s branded that way. The Lunar capsule was not of interest, either. I was hoping for the pretty prints that were released on the Hong Kong site, but no such luck. The only thing I have picked up over the last couple of weeks is the Toasty Tech tights on WMTM. For me, 2019 has been a bust for Lululemon thus far. Agreed! I understand selling branded merch at a Soulcycle studio, but not on LLL’s site. That would be like LLL x Planet Fitness (no hate–just an example). It’s applicable to such a small demographic that it doesn’t make sense to me. I’ve been needing a new pair of black aligns, so I picked up the lunar capsule version today. I’m no a spinner anyway (I may go to spin class once a month) so I am not into SoulCycle collection. I also didn’t like what they did with Lunar year stuff this year. I much preferred last year’s red and black theme. All this is good for me and my wallet though. We are travelling a lot this year so more money for that. I also bought the lunar tote and love the Suminagshi print Half Zip in serene blue First Lab item I have purchased! Why would they do this? Honestly not everyone cares for Soul Cycle. I don’t even know if there are any in Canada. Total miss here. I bought the new sonic pink free to be serene. Still waiting for a pretty teal color to be released. That’s the only lulu bra I like! I like the cameo color, I wish they had more than just a couple Soulcycle items in it. I’m with everyone wondering how a metallic logo makes tights “Lunar.” They’re blatantly ripping off Athleta now, in particular the Chakra Tights and Barre Rib/Elation Hybrid Tights. I like some of the new colors from the Soul Cycle line but everything is a hard pass, especially those tops. All I can say is that after their website decided to flag all my credit cards as “fraudulent” and they asked me to provide the back pages of my bank/credit card statements (redacted) via non-secure email to confirm my identity (at what, $4000-5000 later), Lulu has definitely lost a customer. These uploads are not making it difficult to stick to my guns. Too bad though, I really miss their educators! I might continue to visit them just to say hi! And of course I’ll still visit your site Cristina! You’ve turned me on to many new brands I now love! So glad it’s not just me on the credit cards on their site. SO sick of it. I’ve bought $1000s from their website and this how they treat customers? I couldn’t help it…..bought the Lunar New Year red Scuba. I’m not crazy about the huge LULULEMON logo but the colour…….the red is brilliant! I just hope that the colour is that true vibrant red! I’m so tempted by that red scuba too! Once you receive your order can you comment if the red is like the vibrant red in the pictures? It’s so hard to tell from the website pictures lately!! I like a couple of the soulcycle pieces, but I have never been to soul cycle (there’s no studios within 500 miles of where I live) and I’m a peleton girl. I would MAYBE buy a lulu x peleton item, or i would have maybe bought an item from this capsule if it wasn’t branded SOULCYCLE down the leg, for example. This is kind of a niche/miss for me. 1). What is the waistband like? Is it similar to Aligns, Fast and Frees, or All the Right Places? 2) Is it TTS? (The only pant I size down for is Aligns because of the waistband and material). It’s a lot closer to the aligns. The Fast & Frees constantly want to slip down on me. They are TTS for me but if you size down in aligns you may want to consider sizing down in these. The opacity should be the same. I for one HATE soul cycle! I live in NYC and there are many many studios. It’s the most assanine method of indoor cycling. I took 5 classes about 2 years ago. I’m a cyclist and competed for my college. Since I love cycling, I thought it would be a good idea to take classes with my busy work and grad school schedule. That was a mistake. I don’t understand why an indoor cycling capsule would be marketed for its reflectivity. I know you can use it outside obviously, but it seems a little odd. That being said, I do like the splatter print but not for $148!